If you’ve found yourself in a leadership role at your company, you’re typically going to have to wear a lot of different hats throughout the course of the day. There is certainly no shortage of responsibilities that a manager has to take care of. Decision making, communication, motivation, and coordination all play key roles in the daily functions of being a leader in the workplace. However, as a manager, your primary task is always to make sure that your employees are working efficiently. When problems within your team arise, are you handling them the right way? 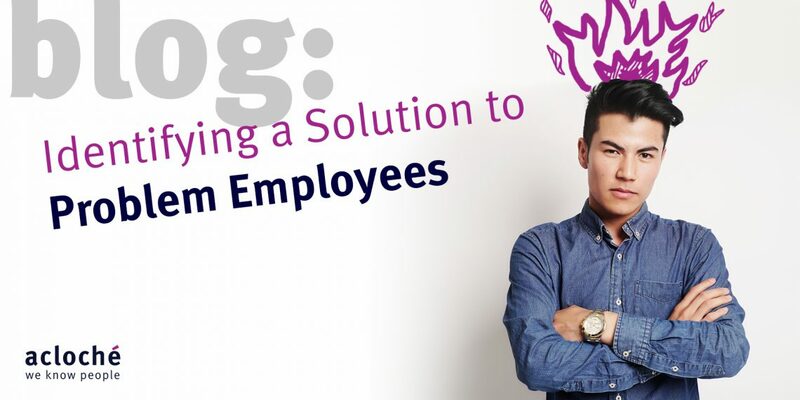 Let’s examine a few strategies for identifying a solution to problem employees. If the title above seems overly idealistic, that’s because it 100% is! Having said that, it’s still important to take every precaution possible to prevent issues before they arise. This strategy begins during the actual hiring process. Try to take the time to get to know your candidates, what their aspirations are, how they’ve performed in previous roles, and how they balance their strengths and weaknesses. This will help you form a better overall profile on the candidate, and help you be certain that the individual is a good cultural fit for your organization. Do you hire the slightly better resume or the slightly better personality? Remember, it’s a lot easier to train for the duties of the position than it is to fundamentally change what motivates an individual. Before taking any managerial action, you have to do your best to figure out what is causing this employee issues. Maybe a different employee or a newly implemented process is making their job a nightmare, causing friction in the office. Observe their work and behavior closely—it could give you perspective on the overarching issue. Ideally, you can pinpoint a root cause, but more realistically you can just build a better idea of what’s troubling an employee. This will also show the employee that you’re invested in their success, and that you’re willing to work through workplace problems as a teammate rather than a disciplinarian. Following on the strategy above, the best way to find a viable solution to problems an employee may have is to work directly with the individual. Your company may have a protocol or best practices guide in place, and certainly use those at your disposal, but keep in mind that you’re dealing with a person. This person has their own goals, motivation, attitude, opinions, hair color, favorite Netflix show, and everything else that forms a person’s sense of self—there is no “one size fits all” strategy! If someone on your team has been struggling at work, whether that means struggling with their attitude or their output, there’s a good chance that they themselves have already thought about strategies that would help them overcome these issues. As a manager, you’re not likely going to be able to adopt those strategies outright, but perhaps you can include elements of them when forming your own solution. Show that you want to engage the employee and value what they have to say! As their manager, the employee is anticipating your directive. After you’ve examined and discussed the problem at hand, it’s imperative that you give clear and concise feedback. Make sure you outline to the individual which behaviors are not acceptable, and how they are going to be evaluated from this point forward. But remember, this discussion must be framed with a comprehensive knowledge of the problem. The employee needs to understand that you understand the underlying causes of their issues—if not, they will get put on the defensive, creating a greater fissure between you and your employee. Agreeing on a clearly defined solution will put you and your employee on the same page. From this point, you can assess how they have changed their behavior or improved their performance. If things do not improve, there are no surprises when further action must be taken.